Summer is coming, and we will be heading south to play two concerts! On June 29, we will play the first show in Simbach am Inn at the Musikzentrum La Musica. We’ll start at 7:30 straight! On June 30, it will be time for our traditional gig at the Cabaret des Grauens in Burghausen. By then, new material from EAR will be available: in mid June, we will release on Spotify, iTunes etc. the EP Gardens at Night featuring three new songs. More info to follow soon! Take care and see you there! We’ve made new instrumental versions of our last 4 studio albums and also included outtakes and previously unreleased songs. They can be downloaded in the music library and they are ready to use in films and theater plays. You can have a listen here! Also, we are currently working on a new EP to be released before Christmas – more info coming soon. Stay tuned and take care! 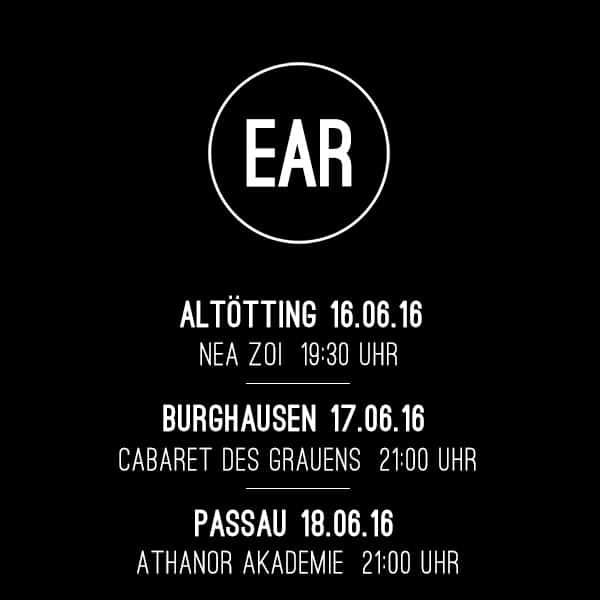 03.06.2016 / EAR On Tour! 16.06 – Altötting – Nea Zoi Kulturcafe at 7:30 p.m.
17.06 – Burghausen – Cabaret des Grauens at 9:00 p.m.
18.06 – Passau – Athanor Akademie at 9:00 p.m.
On June 16th we’ll play in Altötting at Nea Zoi Kulturcafe. We’ll start early, straight at 7:30 p.m., and afterwards we’ll all watch the football games of the European Championship together. On June 17th we’ll return to Cabaret des Grauens in Burghausen and our last show will be on June 18th in Passau. It’s our first gig in this city and we are happy to be part of the open-doors program at Athanor Akademie. Both shows will start at 9.00 p.m.!